Stampin' up convention is under way in Sydney. Just because some of us can't make it doesn't mean we can't have fun. The Extra Special Australalasian group specially for SU Demonstrators decided to make the weekend exciting with regular challenges and other fun events. This is my version of her card holder. 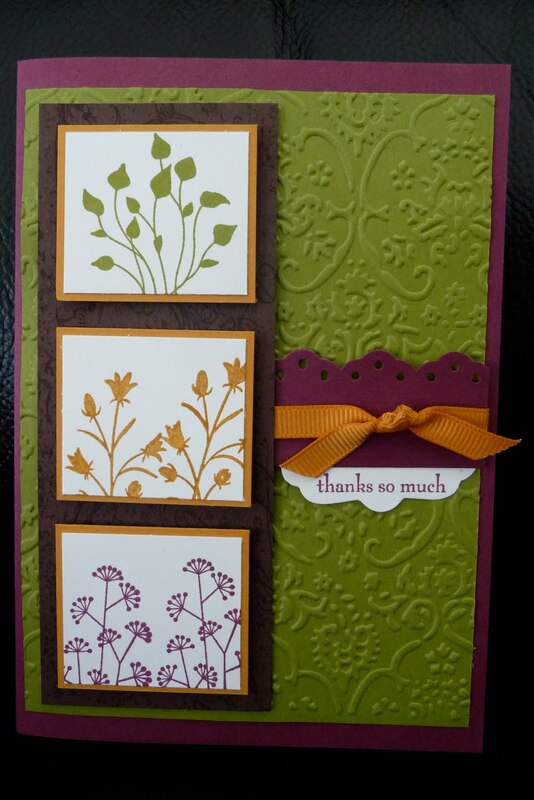 I used Tea party DSP the flight of the butterfly stamp set and punch. Michelle's challenge was to use 4 colours, More Mustard, Chocolate Chip, Old Olive and Rich Razzleberry. Thanks to my friend Kim who gave me the Rich Razzleberry. Ok so this is how it works we were only allowed 2 SU colours, 1 stampset and white or vanilla card stock. That means no dimensionals, no sponging no ribbon. This just goes to show you don't need a lot to make a great card. Once we made our card we had to take a photo then jazz the card up. I must say a special thanks to all the wonderful ladies who have been working hard to make Unconvention so much fun! Cool cards. And I really like your Card Holder - lovely colours. I like how you did the Ribbon & Butterfly. PS - It was heaps of fun wasn't it. I have not Carded THAT much in ages. I used an entire roll of tape! !